Once in a while I like to read a good Western romance. There's something about cowboys and the rugged setting of the Wild West that I find appealing. 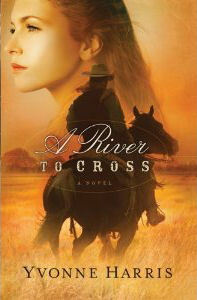 A River to Cross takes place in Rio Grande, Texas in 1886, where Elizabeth Evans is kidnapped after her brother is killed for exposing the dangers along the U.S.-Mexican border. Texas Ranger Jake Nelson is commissioned to rescue her and to apprehend Mexican General Manuel Diego who is responsible for bad relations between the two countries. Harris succeeds in bringing the setting to life for me, from the dusty, hot trails bordered by cliffs to the small Mexican town of San Miguel with its whitewashed mud houses and sandstone church. I learned about Texas Rangers and their role at a time when boundaries between countries were not so clear and disputed. Harris writes with confidence about the Old West and she infuses her narrative with subtle humour. It's clear she is comfortable writing about politics and the military. Although I enjoyed this novel, there were a few things that I questioned or that didn't jive with me. Elizabeth sees her brother (with whom she was close) get shot and die just before she is abducted, but from the time she's rescued a few days later there is no mention of her mourning him at all. It was as if he never existed. Instead she is quickly enamoured with Jake, giggling with him, settling back into normal life and dating him on her return home. She never cried once for her brother or the dire circumstances of her family. It's like nothing happened. She has a little niece (her brother's daughter) with whom she lived and again there is very little mention of her seeing or comforting the child who just lost a father and had lost a mother not a year ago. The romance seemed to take precedence over everything, making some situations very unrealistic and it was the least exciting aspect for me. The dialogue seemed awkward at times and did not always suit the characters. I think this book needed better editing. Elizabeth is a senator's daughter brought up in Washington as a socialite, yet she comes to the small town of El Paso and adapts without mishap to life in the rugged, dangerous West on her own, without a maid or chaperone. She cannot cook she declared and we see this when she dumped a whole pack of rice in boiling water and made an inedible mess, but not a month later she cooks meals for ten hearty Ranger men? As much as I liked the setting, I did not care too much for the characters. There was no tension in their relationship and they felt like a “modern couple” rather than characters who lived in the 18th century. The enemy Diego shows up a few times but didn't come across as a real danger, even if he did want to kill Elizabeth, which seemed a little far-fetched since she did not publish anything to warrant this in the newspaper business she took over from her deceased brother. Incidentally, this too was very little explored in the story although it was supposed to play a major role. Too bad, because I was looking forward to seeing how a woman tackled journalism in a world where men dominated. Instead, it was glossed over. Everything came across as easy for Elizabeth, with not much internal or external struggle. Overall, this was a fast, simple read. If you like romantic antics within the setting of the Old West without caring too much if the plot is good, this book will do. Great honest review! I also sometimes feel the need to read an old west cowboy story. I think I'll skip this one!